There is but one catch, hiking the stairs is illegal, some of the reason proffered for this include the danger associated with the hike, complaining locals against the slew of tourists converging on their lawns, land usage right issues, the list goes on but whatever way you cut it the result is the same, you can’t legally hike it. While on the island for a week a group of us came across a guide charging thirty bucks a head to take people to the stairs and hike to the top avoiding trouble with the law so a few of us set out at 1pm from Waikiki and made our way to the stairs, guide in hand, this was his second tour of the day to hike the stairs. Below is information outlining the route taken including maps, GPS trace co-ordinates, images and other information about the hike to climb the Haiku Stairway at your own risk without shelling out $30 to a guide. Take a look at the map above, you can click on it to enlarge it if it’s too small. The map is a plot of the GPS co-ordinates taken by the group with some waypoints added to make following the route easier. You can also download the route map file here and follow it in real time using Strava on your smartphone. If you’re driving make your way to the start and park up on Kuneki St, busing, biking, or hiking to the start may also work. From this viewpoint you get a good view of the climb ahead viewed from beneath the freeway that wraps its way around the base of the mountain before disappearing into a tunnel on one side. It’s probably best not to hang about here too long as the residents may try to eat you. Walk over to Kuneki Place to a fence about 100m down on the right hand side. 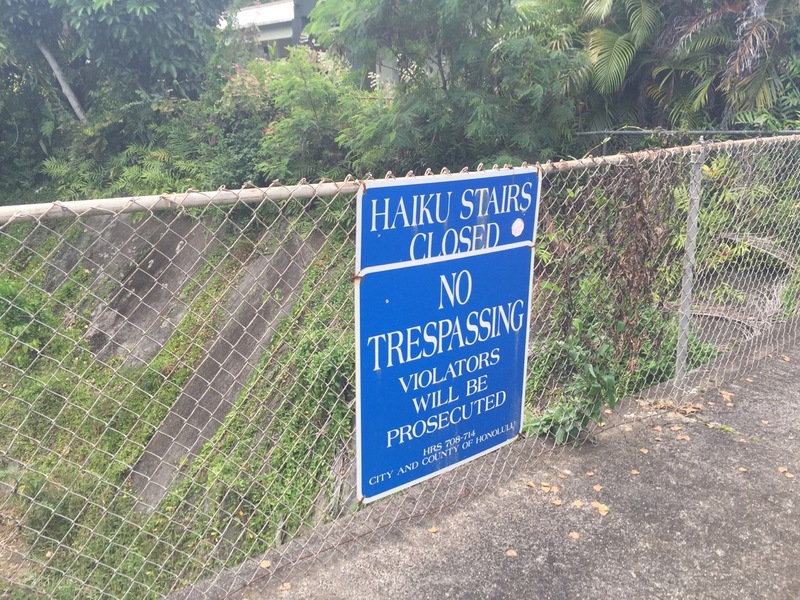 The fence has a blue sign on it advising The Haiku Stairs are closed, to get past the fence there is a small gap on the left side between it and the wall so squeeze through it and jump down into the storm drain. Continue through the channel and exit it heading slightly left and uphill until you come to a tunnel. Check the map above for the route from the fence to the tunnel. At this point you are only a few meters shy of being under the freeway. When you get to the tunnel climb through it and exit at the other side to the right and keep walking following the freeway overhead until you hit a road, this road leads to the official step one of the stairway and the security that guards the entrance. Keep an eye out for the bamboo forest entrance on the left about 300 metres from the tunnel. The trail through the forest to the stairs is the most difficult part of the hike, the ground soil is loose and steep in places without much to hold onto, keep an eye out for the orange markers tied to the trees to guide your way, there is somewhat of a path beaten that you can follow due to the volume of people still attempting the hike every day. From the stairs start take a look downhill and you should be able to see a car and a portaloo at the gated entrance to the stairs that you just bypassed, this is where the guard hangs out. This is the unofficial stairway access point from the bamboo forest, the access point is roughly at the same level as the freeway, once you hop over the handrail you’re on the stairway and the rest is easy! Once you get to the stairs expect it to take slightly over an hour to climb to the top, there are two or three level platforms along the way that you can stop and take a break while appreciating the view, the climb up is tough enough and quite steep in places, you will at points be concerned at how difficult it may be to descend the steeper sections on the way back down but the descent is much easier and quicker than you may think. It is useful to wear gloves on the stairs otherwise you will most likely develop blisters from continuous contact with the handrails. There were reports of storm damage in the Huffington Post to the stairs making the summit unaccessible but this is untrue, the damaged part is a level section along the stairway and it is still easily passable. Remember on the way back down to exit the stairs at the same point that you entered following the same route back until you leave the trail. I do not advocate any individuals break the law to make this hike, if you do so, it’s at your own risk, you may get arrested, fined, break a leg, loose your kids, die, etc, etc, etc, this is your game, play it how you wish. how did you find the guide? can you email me his/her information? I’d be interested in using a guide to go on this hike. Hi Ashley, unfortunately I don’t have his contact information. I think he was only doing the tours for another week after us before he left the island. Hello, did you ever come in contact with the guard before you entered the stairs? Wondering if myself and a couple of friends should hike the way you’ve done it or go the moanalua way? Please let me know, thank you! Appreciate the advice. No contact with the guard the way we did it, the trail cuts around him/her and gets you on the stairs a few hundred steps from the official stair start. Just saying thank you! We made it up today. Yay for orange flags!! The guard obviously saw us all the way up an back down. Another couple even ran right past him. Not to worry there. Ahhh so cool, glad you did it, it really is a cool hike! Thanks for posting this Tony. This looks really helpful. I’m looking into options on how to hike this route when I’ll be out there in December and this is the best I’ve found. Wondering if you had these type of instructions is it even worth trying to hire a guide? Also any other resources you may have come across that are worth sharing? Hi Dave, everything I know about the hike I have put here, the current situation may have changed by December, who knows! Good luck with the hike. Just followed these directions for our hike today! It was tough bc we got lost quite a few times, but you were right! The hike from the bamboo forest to the stairs was the toughest hike. I slipped down a muddy path, but thankfully didn’t get hurt. My advice: wear mosquito repellent!!!! We were nearly eaten alive by all the mosquitoes. Awesome blog Tony. BTW Where did you guys park? Thanks! Will be doing this in a couple of days! We went around 7am and just parked on Kuneki St. Also want to note that we didn’t go through the tunnel to get to the paved road, but it wasn’t too hard to find our way out. Depending on where you come out of the woods, the bamboo entrance is probably on your right. We went to our left and learned the hard way that the bamboo entrance we took was wrong lol. If you’re following Tony’s directions, the bamboo entrance looks EXACTLY like his picture so if it doesn’t, it’s not the right one. Also, when we were on the stairs, we saw the guard let 3 people on, making us feel kind of silly going through all that effort to get to the stairs, but I have read online that some people aren’t as lucky and get turned away by the guard so use your own judgement. 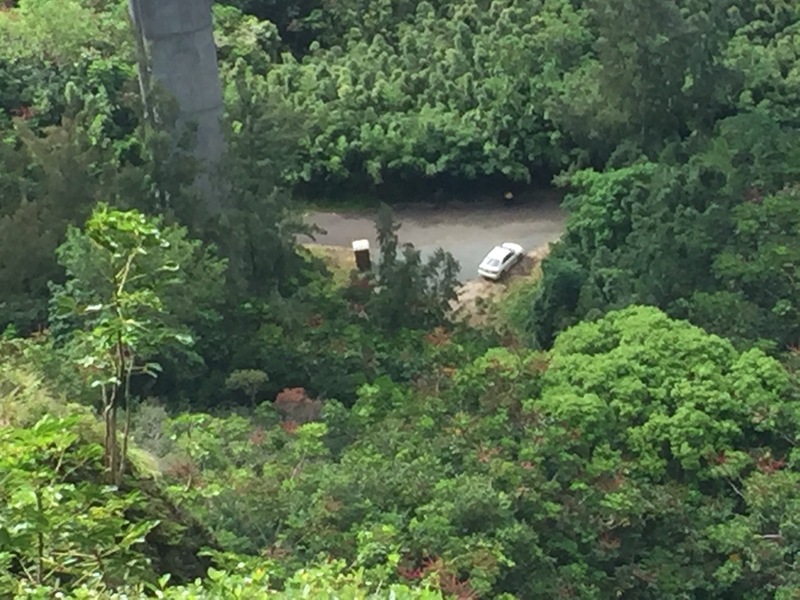 When we came back down, it was still just the guarf (no police) we were just like, screw it, just going to go past him bc I didn’t want to climb through the bamboo forest again and all he did was make us fill out a trespassing warning with our names or I should say “aliases” lol. We were lucky though, heard the cops were coming at 2 and when we left, it was 12. If you see a cop car, DO NOT go towards them, you WILL be issued an official warning. I should have thought twice before putting up the orange flags. They were originally gonna be for two hikes a few days apart, but now i guess it has surfaced into a new “hike” that people think they discovered. Now i’m gonna have to find a new route that people are gonna start following again. What exactly is your point? Do you want kudos for tying orange string to trees? What’s the point of making a blog post about this route? Do you want kudos for taking pictures of different points on a hike that a guide took you up, using another person’s route? hahahah tying orange string to trees… you’re pretty ignorant if you think that was all that went into making that trail so easy. I bet if you went in those woods a year ago you wouldn’t have found your way out, let alone the stairs. 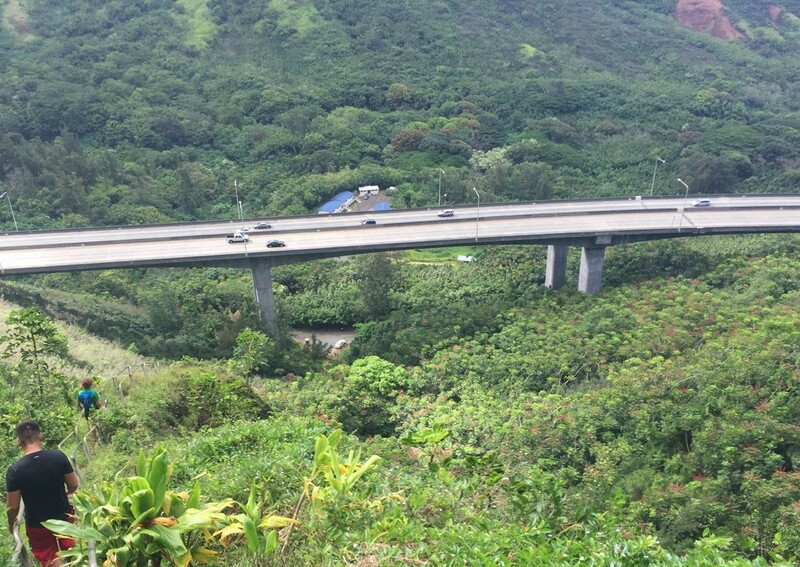 Tony’s Response: Clearly if you read my blog post instead of trolling it you would see that I posted about the Haiku Stairs because there are lots of people that want to hike it but are not sure how to go about it. Hopefully this post will help people hike the trail and enjoy it as much as I did and I’m sure you once did. My intent was never “trolling”. Maybe I didn’t come across how i intended. I live on Oahu and have hiked this trail many times, probably 60-70 times (about 20 using this route) along with friends of mine. I have had the police called on me a few times using the other routes but have never been in trouble. This route is very effective in both getting around the guard and avoiding trouble in the neighborhood. But with you posting it, many unexperienced people will attempt it, and the guards along with the police will catch on and it will have the same risks as the other ways of doing this hike. Two days ago I did this hike, and for the first time i saw other people on the “bamboo trail”, they had gotten lost and missed a right turn, so I showed them the way to the stairs, I asked them where they got the idea to use that route and they directed me to your post. I believe you that your intentions were good to both help people find the hike, and make it easier for them to enjoy it, but their are some downsides. Just like the back way has become so much more popular due to a lady posting the route on yelp, a few weeks after her post a kid from the big island attempted that route and was lost never to be found. Please be careful about what you post it makes a big difference both good and bad. It maybe would have been a bit more appropriate to leave out a few details and tell people they can private message you for more details about the hike. Your blog was well written and a good tutorial, which can help out many people, but it also has the chance of getting people into trouble. Sorry for rambling, Mahalo. btw.. when i found that way around there was no beaten trail and you couldn’t get anywhere without chopping down bamboo, now it has been beaten to death. Wow, those stairs look intense! But the views, amazing. How would you recommend finding a guide or do you have a namecfor who you went with? Why are you promoting traspassing, an illegal activity? Sounds very self centered and no respect for private property. Ray, it truly is a pity you can’t read! We are in waikiki for the next week and would love to climb the stairs, is there anyway to get in contact with the guide that took you? Hey Tony! Quick question: where did you find the guide? or do you still have his contact email/phone? I`m heading to HNL in December. Cheers Veronica, the guide is no longer on the island so I can’t help you! Hey! Where did you find a guide?? Hey I can read the paragraph you wrote. Can you email me at mikej411@gmail.com? Hey Tony, will the guard see me if I take this route? 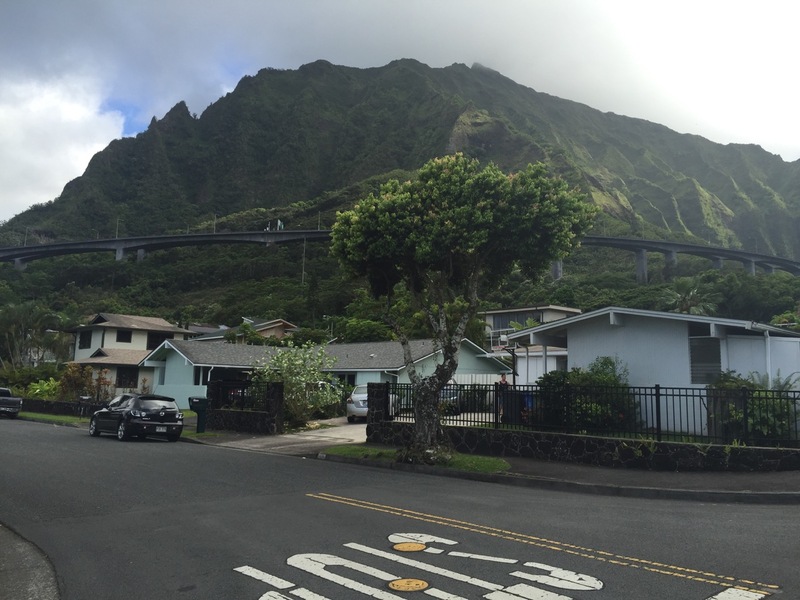 I saw differents way to get the haiku stairs, I would like to follow your way but I’m scared if the guards stop me. You didn’t say if you have been some troubles with them? By your way, do you have the possibility to avoid them ? What will be your advises ? 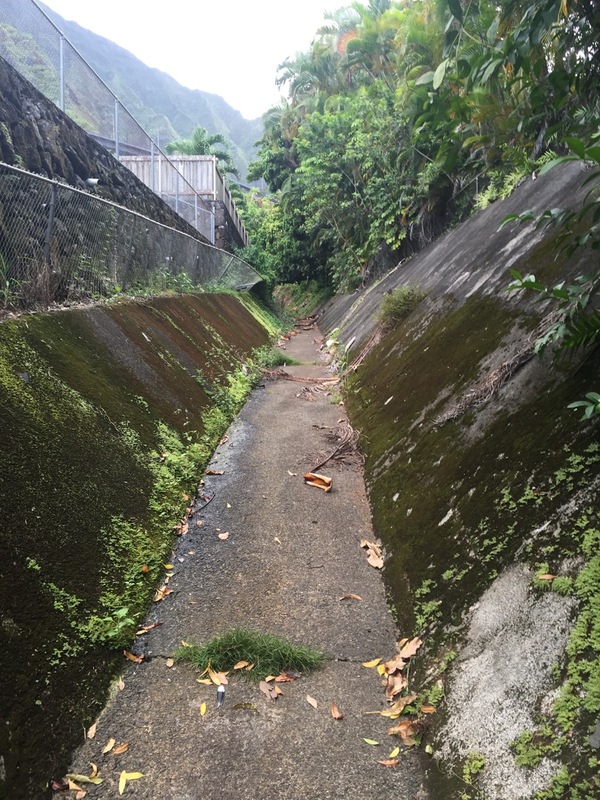 Tony- My son Colin and I did the Haiku Stairs on Oahu today, entering via the storm drain. Thanks so much for that post. We made one mistake. Hiking through the bamboo forest we came to a fork in the trail: we went left (and up) instead of right. It was a steep ascent and got to be quite difficult, even slightly dangerous in places. Finally we emerged on the top of this little rock, which we thought would be the Haiku Stairs. Unfortunately, we looked over and were separated by a steep and impassable cliff drop from the stairs, which were probably 50 yards west of us! We came all the way back down and eventually made our way to the stairs. An arduous day, but worth every minute of it! Thank you for this Tony! We will finally be trying this hike next week. I’m gathering as much info as I can about it. Really hoping that I’m overthinking it. Also hoping that storms over Christmas did make things impassable. I’ve heard that ifnits cloudy at the top to not bother going clear to the satellite as the views are just as incredible 3/4 of the way up. Also, you showed great restraint on that wuss anonymous hiker. He wa full of himself. Bryan. We were not successful. We even went the day before to scope the neighborhood and surroundings out. Got there at 5am. The neighborhood is super narrow, all cars parked on the street. We went to the entrance on the left where you have to go thru the bamboo forest after jumping the fence. The hole in the fence had been patched. The fence has an additional level of difficulty beyond the grease that we expected. Dog feces. The fence is twice as tall as a normal chain link and no bar along the top so it was fully waving and bending as my daughter climbed. It wasn’t really scalable for her so we decided to drive and find another way but were pulled over by police. This made us more determined for next time. Our plan is to take a whole day and climb the legal way, from the back When we get to the stairs we’ll prob only go down the stairs a little bit, take some pics and then go back the way we came. Either that or hire a local to get us through. I’m on IG as @clisty. I’d love to hear if you make it! Have a wonderful trip! Cece cheers for the update on the route, that’s a pity it’s all blocked off now. Did you make it up? There’s a guy in Instagram called matt_the_mountain_man. I am pretty sure he is for hire to take you up. Judging by his posts and the people who tag him. I think what happens is they go up the legal way from the ridges in the back and then you descend the steps to a certain point and then you go back the way you came. You never hit the bottom of the stairs where security is. And honestly, it’s the middle of the stairs that’s the sweet spot for the view and pics, you’re out of the clouds at that point. I’m leaving for O’ahu tomorrow but I don’t have it in me for an adventure this time, haha. Next year.